Advertise in The Triangle for unequalled access to residents of Bermagui, Tilba, Cobargo and Quaama and the green spaces between. Call (02) 6493 8369 or 0407 047 404 to discuss your needs and book a space, then email your ad to advertise@thetriangle.org.au before our advertising deadline on the 19th of the month. Contacting us earlier would be great as we have more time to process your ad. We prefer ads in MS Word and images in JPG format sent as an attachment. Pictures should be their ‘original size’ 1mb or more. 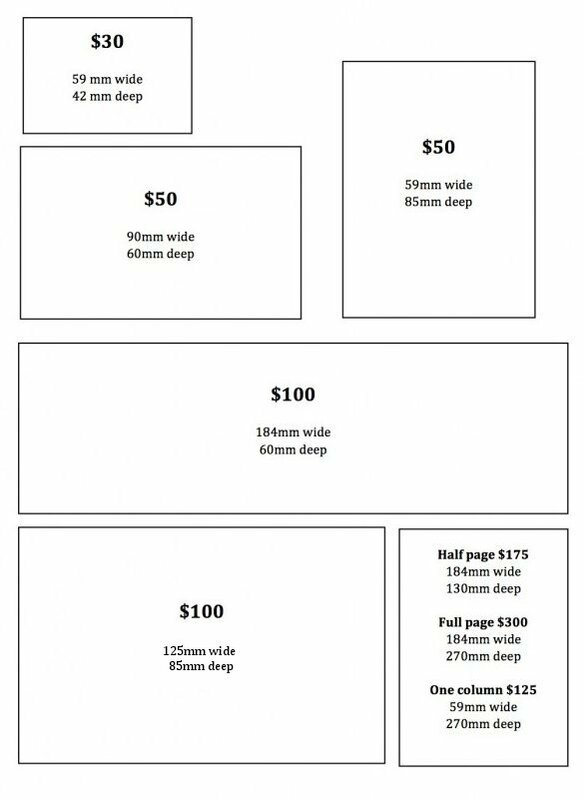 Ads can come as a PDF (refer to sizes below) but must be exact as we’re unable to scale them. We can lay out your ad for you if you like. Current advertising rates and sizes are shown on the graphic below. Box sizes are a guide to the shape of the ad only, not the size! Please refer to millimetre sizes stated.